On Friday October 24, 2014, the Jacksonville Historical Society will stage the second annual Halloween Party in the Casket Factory, following up on its 2013 success as the greatest Halloween party in Jacksonville’s history. It will take place once again at the Casket Factory, a mysterious old brick building on the edge of downtown. It is 15,000 square feet, partially covered with vines, and thought by many to be haunted. This event is a fund-raiser to support the restoration and maintenance of Old St. Luke’s Hospital, a National Register landmark constructed in 1878 and owned by the Jacksonville Historical Society. 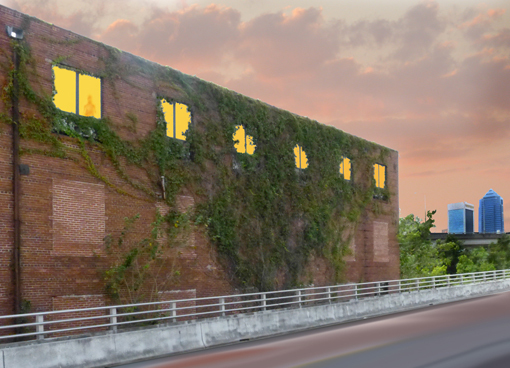 Old St. Luke’s and the Casket Factory are located at 314 Palmetto Street, adjacent to the Jacksonville Veterans Memorial Arena. The party will include live bands (including Mama Blue! ), outstanding food, libations, dancing, a costume contest, and performers. At midnight, the winner of the Totally Amazing Costume Contest will be announced. Our theme for this year’s party is Haunted Hospital! $25 donation to the Jacksonville Historical Society’s Archival Repository, Old St. Luke’s Hospital and the Florida Casket Factory. The remaining $20 gets you into the party, two (2) free drink tickets, a Halloween Party drink koozie, entrance into the Haunted Hospital, food bites from 9PM – 10:30PM, and a chance to win the Totally Awesome Costume Contest (prizes valued at more than $500!). What about food after 10:30PM? After all free food bites have been gobbled up, at least two (2) locally fantastic food trucks will be on site to provide inexpensive food options. Yes! You must be 21 and up to come to the party. We will be checking IDs. Parking will be located at Parking Lot Z (in the Sports Complex) on Duval Street and on Palmetto Street, across from Old St. Luke’s Hospital.